What a weekend ! 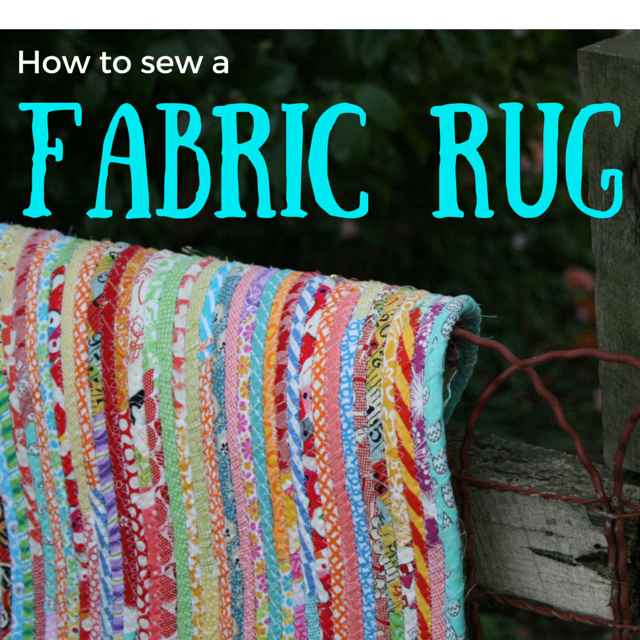 Early starts and long days filled with fabric, fibres and fun!. I have just been luck enough to spend two days at the AQC . 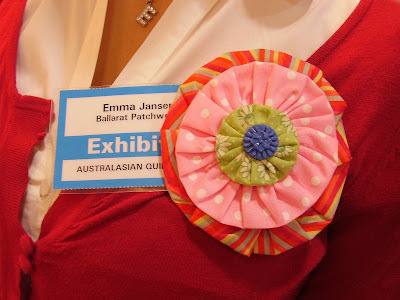 I was asked to go along and help out my friends Emma and Pam of Ballarat patchwork. They had the most beautiful stall and were surrounded by customers (sometimes five deep) for hours on end. One of the big hits of the marketplace was the Yo –Yo. 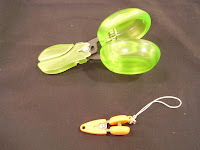 They are such fun and easy things to make (especially with the Clover “quick yo-yo maker). 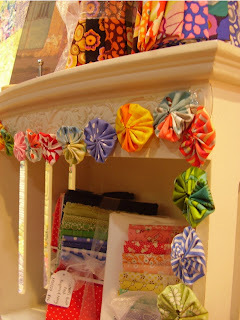 People loved Emma’s gorgeous rosettes and her garland and we completely sold out of the yo-yo makers. It was fascinating to see a show from behind the counter and to meet some of the most amazing people. 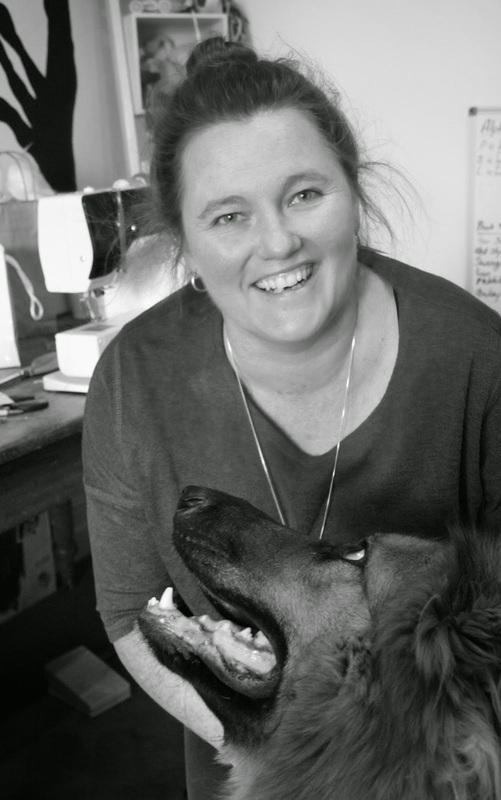 I was lucky enough to have a brief chat with Lisa of Dyed & Gone to Heaven. 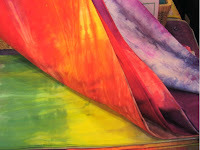 Her hand dyed fabrics are just breathtaking and the depth and range of colour are truly inspirational (and she is a lovely welcoming person !!). 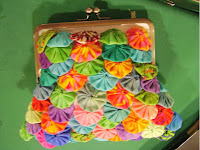 I met and secretly almost fell in love with Tony Sullivan of Victorian Textiles. He is the gadget man !!! 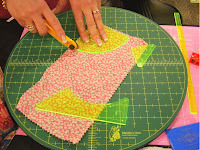 I especially loved the rotating cutting mat, his tiny tiny scissors that fit onto a key ring and the scissors with large pad handles and spring loaded opening action. He had every gadget you can imagine and I wanted them all! I love gadgets !!! 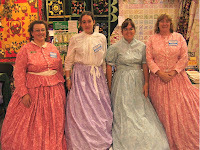 I also met Christine Abela of Gecko gully and her friends who as you can see went to a lot of trouble for the show –there is 8 metres of fabric in those dresses! Of course the marketplace was only a small part of what was happening at the AQC. 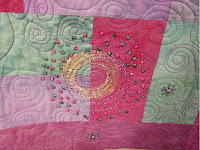 The AQC is a world class quilt show that showcases a collection of exhibitions. With teachers like Ruth B McDowell, Gloria Loughman, Pam Holland Sue Nickells and Esterita Austin it is no wonder that delegates were already booking accommodation for next year before this years convention had ended. I have to mention the breathtaking exhibitions !!!! I was amazed and humbled by the magical quilts on display. As a bit of a show junkie I have to say this is far and away one of Australia’s best events. I was there for two days but could have quite easily managed four. Even if you are not a delegate there are so many free seminars and exhibitons you would be hard pressed to fit it all into one day. 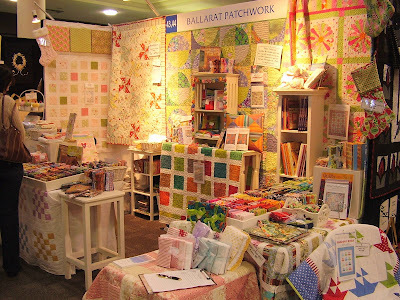 By far the best thing about this show is that it is a dedicated Quilt show so every where you turn you will see quilts, quilters, notions, fabrics and fibres – you just have to breath deeply and take it all in !